If you have the opportunity to plan for your future in advance – then do so! We are constantly learning more about how long we might live and for those of us in our fifties we might have a further 30 to 40 years to enjoy… It is important to consider how best we can plan for this future and the different perspectives involved to help us with our options. Let’s focus for the moment on the “company” perspective versus your own requirements – you both will have different objectives and if you could align at least some of these, then hopefully you could both gain value from your future planning. Do they need your expertise, what key skills do you have and how do you add value to the business? Are they open to discussions around how best you can continue to add value up to and even after retirement age? How innovative are they when considering their employees requirements? Have they looked at their remuneration and benefits structures to understand how to retain, develop and motivate your generation? Are they aware of the differing generational needs within the company and their customer base and how they could be embracing this diversity? How far in advance do they plan for their human resource needs? There is a big difference between what an entity’s Human Resources department may think you want and what you would like – how would you approach a conversation with them if you were asked “We would like you to remain with the company until you reach official retirement age and then we would appreciate you continuing to consult for us for a further five years”. Do you enjoy working for the company, is your role fulfilling, are you committed to the company and its values or is it “just a job”? How have you done with your financial retirement planning, will you need to work after retirement to maintain your living standard and to do all those things on your “bucket list”? Are you able to put aside your “ego” and re-think the role and value you might add within the company, for example you may become a mentor or coach to some of the up and coming future leaders? Are you open to continued growth and development within your company and profession and on other aspects that might be useful into the future? Do you value benefits other than just your salary, for example training, work from home opportunities, pension and medical options? Answering the company’s question posed above needs some serious consideration and planning – FutureRisk has been working on a new concept around Personal Risk Management incorporating the principles of Enterprise Risk Management and business/life coaching. The model shown below is still under development but seeks to work with individuals to put together a holistic longer term plan which is updated and adjusted regularly as external and internal changes occur. The key objective is to support individuals to plan in advance and to make the right choices when faced with a life changing decision, having considered all of the risks and opportunities around the future and the specific decision under review. 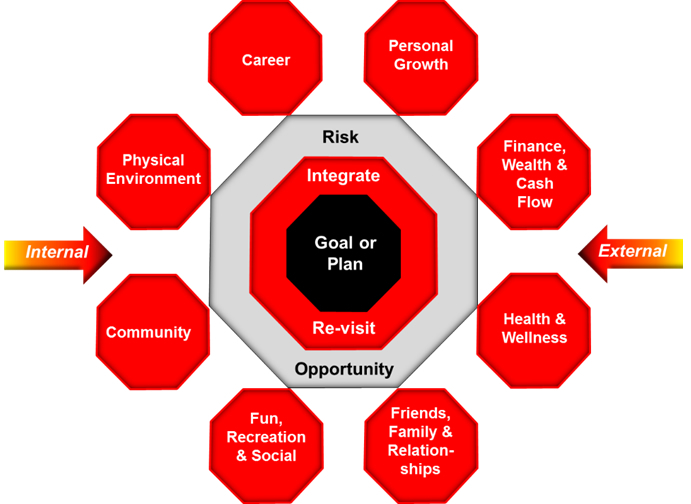 As you can see, there are eight elements or risk categories that we focus on to unpack your future plan. Within each of these categories we have developed specific aspects that might impact your future and which might need your consideration. Let us know if you would like to work with FutureRisk on your own future! I would be very interested in working with FutureRisk as I approach retirement (not by choice). I find this a daunting period in my life. How do I go about engaging?